Rift Valley fever is a zoonotic disease, which affects humans, ruminants and camels. It may manifest itself as a fatal haemorrhagic disease syndrome in humans, either as sporadic cases or during a major epizootic involving animals. There may also be many severe influenza/malaria-like cases, some with ocular or neurological lesions. 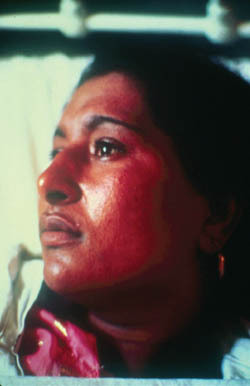 Hepatitis is a feature of both human and animal RVF cases. In animals, RVF manifests itself with a sudden onset of abortion in a large proportion of the herd/flock, associated with high neonatal mortality. Clinical examination of individual animals reveals a biphasic febrile reaction with severe prostration and collapse in young animals, agalactia in milk animals, lymphadenitis, debility with jaundice and deaths in older age groups. 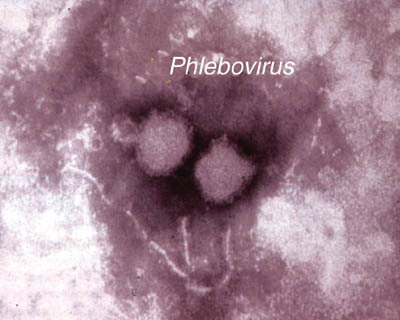 RVF is caused by an arbovirus of the genus Phlebovirus of the Bunyaviridae family. The virus replicates in mosquitoes and in vertebrates. It has a lipid envelope and two surface glycoproteins G1 and G2; the genome has three segments L, M and S. Genetic characterization suggests that all strains are closely related but there are some regional differences, suggesting two or three regional virus types. The RVF virus is serologically related, by Immunofluorescence Assay Test (IFAT) and inhibition of haemagglutination (IHA), to some other Phleboviruses from South America, but can be readily distinguished from these by virus-serum neutralization tests, which are specific. There is only one serological and immunological type of RVF virus. Sheep, goats, cattle and camels are the domestic animal species most affected by RVF. However, there is considerable variation in the levels of susceptibility of the different breeds to the virus, from infections that are inapparent and have no sickness or febrile reactions, to high temperatures, severe prostration and death in animals that are most susceptible. In general, breeds that are non-susceptible are those indigenous to the tropical and subtropical zones in Africa, while those highly susceptible are the European or imported genotypes exotic to the continent. Birds and pigs are not affected. The small ruminants in the arid and semi-arid ecozones, where RVF virus activity only occurs after long intervals, appear to be more susceptible than the sheep and goats in the Guinean and Sudanese zones of Africa. RVF virus activity occurs more frequently in the Sudan. The indigenous cattle breeds show a marked resistance to RVF, compared with imported breeds. There may be no abortions in pregnant cattle in indigenous herds while there are high abortion rates in exotic breeds on the same farm. RVF infection in adult camels can manifest itself as a clinical disease, with abortion rates that may reach 100 percent of pregnant animals. Some neonatal mortality may occur in camel foals. Primates, rodents and carnivores are susceptible to experimental infections with some deaths, but no mortality has been observed in the wild. The many wild ruminant species in Africa sustain a brief period of viraemia and abortions have been reported. The African buffalo (Syncerus caffer), for example, develops a transient viraemia and may abort. Many wild ruminant species have antibodies to RVF virus and show evidence of contact with the virus. The Asian water buffalo, Bubalis bubalis, appears to be relatively resistant to RVF, but specific antibodies to RVF have been documented. Buffalo herds mixing with cattle that evidence high abortion rates caused by RVF, have a much lower number of abortions. Some neonatal mortality and abortions in buffaloes were attributed to RVF during the Egyptian RVF outbreak. Although this may have been true, buffaloes still appear to be relatively resistant to RVF compared with cattle. Human disease has frequently been the indicator system signalling epizootic RVF virus activity in many African countries. This is particularly the case in semi-arid and arid zones such as the Horn of Africa, Sahelian West Africa and the Arabian Peninsula. Horses experience an infection that is inapparent with RVF. There is a brief period of viraemia and the antibody develops. Pigs are relatively non-susceptible, but do respond with a viraemia after a high titre parenteral inoculation with RVF virus. Poultry and wild birds are non-susceptible to RVF.